$335.00 plus $15 shipping and insurance within the Continental United States. For local sales, shipping charge will be allocated to NYS Sales Tax. Please email me at JamieWG@aol.com for International purchases or with any questions. There is an old cemetery and arboretum up in the mountains with a fabulous overlook of the Catskills. 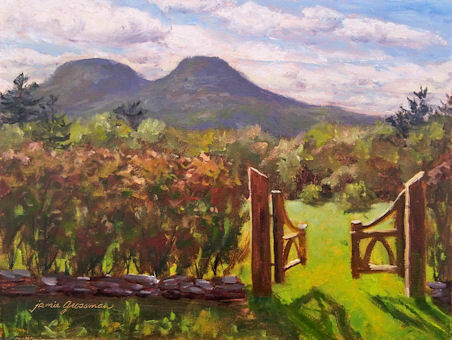 I couldn’t resist this garden gate with the bright green field inviting me in for the view! It’s hard to beat a beautiful fall day of painting at Boscobel Restoration, along the Hudson River in Garrison, New York. The warm color in the sky was there when we arrived, but it didn’t last long. The water was shimmering, and the rusty oranges were just starting their assault on the greens in Constitution Marsh. In a couple more weeks, the marsh will be ablaze with reds. Helicopters came and went from West Point, birds chirped, and tourists strolled the grounds. The barge and red tug making their way upriver were the crowning touch. It was a stellar day! 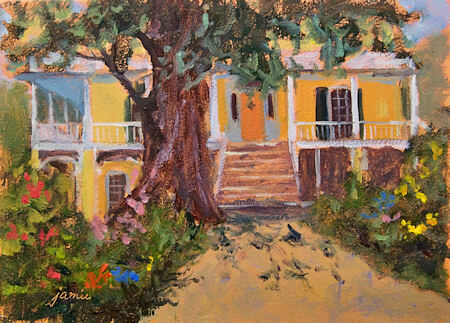 I’ve been wanting to paint this view of the Thomas Cole house from the garden path for years! I had some friends visiting from out of town, so I finally got to do it while they took the house tour and strolled around the grounds. The flowers were so gorgeous, and the yellow exterior of the house glowed, even under the porch roof! That honey locust tree really is that huge; it’s 200 years old! There were a dozen on the property in Cole’s time, hence the name of the estate— Locust Grove. $395.00 plus $20 shipping and insurance within the Continental United States. For local sales, shipping charge will be allocated to NYS Sales Tax. Please email me at JamieWG@aol.com for International purchases or with any questions. It’s that time of year when hard frost can hit at any time up here, and that’s the end of the road for the beautiful sunflowers. When my husband told me that he saw a beautiful field of them up on Route 82 in Hudson, I just had to go check it out. I painted them this morning while they were still in full bloom. Although I’d love to get one more crack at a sunflower field this fall, it’s likely that this one is the “last call”! The fields are starting to change color, and there are hints of reds and maroons in some of the trees. The wind was so strong today. My Soltek easel easily stood its ground, but my brushes and other supplies were blowing all over the place. The wind was a reminder that cold weather is on the way. 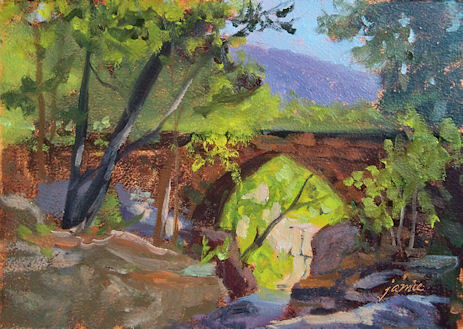 I’m trying to get in as much plein air painting as I can before it gets too cold. The season of peak color seems to fly by so quickly, as if I wake up one morning and all the leaves are gone, and it’s freezing outside. At the top of Kaaterskill Falls, the stream descends from South Lake and cascades over the edge. Along the way, there are these beautiful cascades, with pools of deep rusts in the shallow areas, and blue-greens in the deep sections gouged out by the waterfalls at peak flow. They are the most challenging things I’ve ever painted. I keep on going back again and again in an attempt to capture what I see, but this is the first time that I felt the result was worth sharing! I think all those attempts are finally starting to pay off. 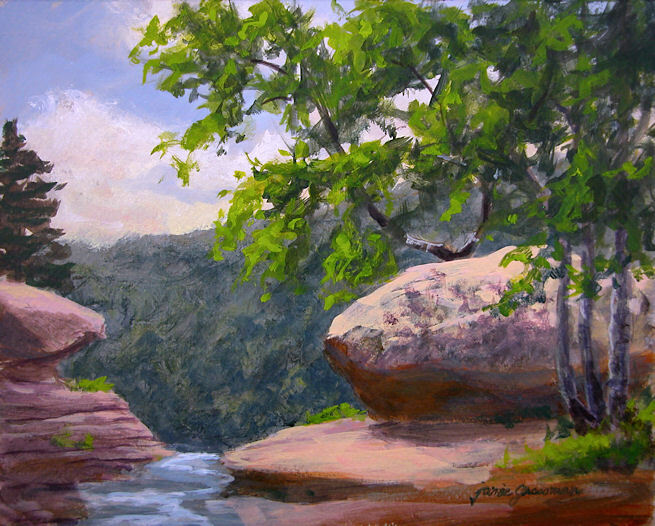 Perhaps it also has something to do with all the waterfalls I’ve been painting in Platte Clove lately. This was also painted with my 5×7″ Guerrilla box. I laid in my composition and somehow the little waterfall migrated right to the center of the painting, all by itself! I had to wipe it out and go at it again, and this was the result. Today was Artist’s Day at Boscobel, and in spite of the exquisite weather, it was surprising that only about six other painters were there. 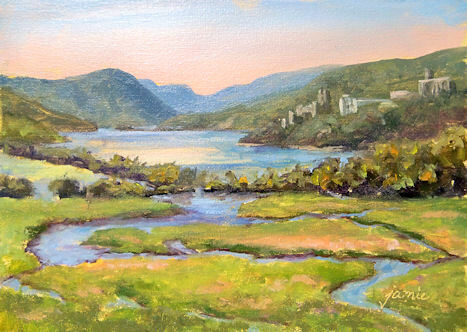 The sun glistened on the facades of the buildings at West Point on the opposite hillside, and the glow of the sky reflected in the Hudson River. I’m sure going to miss this awesome weather in another six weeks or so! For the past few days, I’ve been very attached to my little 5×7″ Guerrilla box. I just can’t let go of this thing! It goes everywhere with me, and I’m starting to enjoy this very small format again, especially since it’s a standard frame size. $495.00 plus $20 shipping and insurance within the Continental United States. For local sales, shipping charge will be allocated to NYS Sales Tax. Please email me at JamieWG@aol.com for International purchases or with any questions. 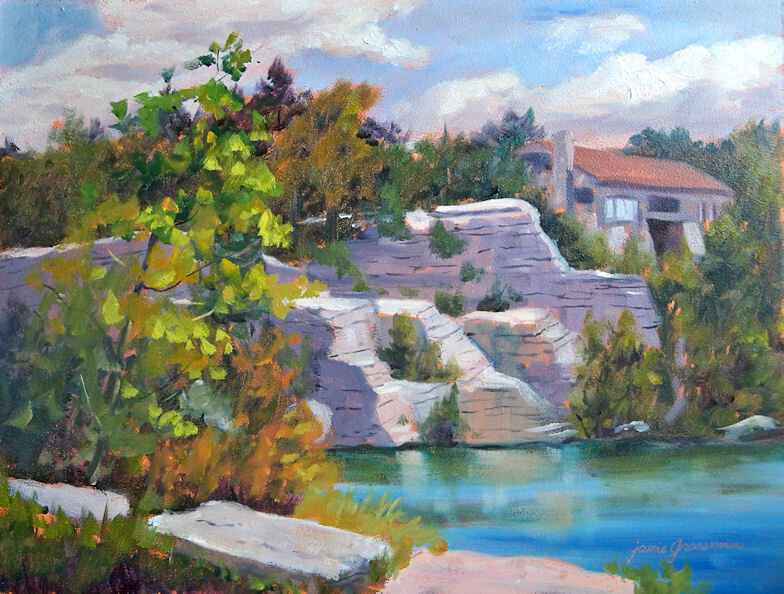 A group of the Lower Hudson Valley Plein Air Painters went to Lake Minnewaska to paint last week. The white conglomerate cliffs and striking water (which varies from teal to bright blue) pull artists like magnets! There is a nice two mile or so walking path around the lake. It’s certainly one of the gems of the New York State park system. I went back to the waterfalls in Platte Clove; I can’t seem to stay away from there for long! This time I was test driving my brand new baby — the 5×7″ Guerrilla Painter pochade box. It’s so small and light, and I can take this everywhere for stealth painting on the go! I got it with the palette extension to give me a little extra space to hold my palette cup, brushes, and a clipped on rag. The palette is still small, but then again, so is the painting. For 5×7 size it worked just fine. It holds two wet panels instead of the four that their 6×8″ box holds, but the 6×8 is deeper and heavier. This one fits right into the pocket of my pack stool! I’ve been so busy this week. My fellow Daily Painters Laurie Pace and Kimberly Conrad are visiting from out of town with their husbands. We’re all having a grand time. My Daily Painter friend Gretchen Kelly also came to join us yesterday. We toured some of the “Hudson River Art Trail”, managing to visit Olana, Locust Grove, North South Lake, and Kaaterskill Falls in a single day! Tonight I’m cooking dinner for everybody — fresh corn from the local market, chicken breasts with pesto sauce, carrots, a huge salad, and stewed fruit with whipped cream for dessert. Mmmmmmm…..
My friend Melissa invited a group of us to paint at her family farm in Millerton, NY. 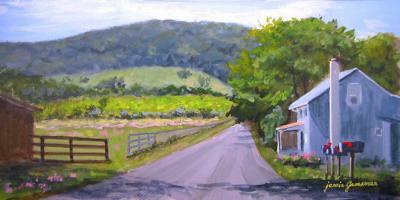 It was hard to choose what to paint because there were so many beautiful scenes in this charming valley between two mountains, but the red mailbox flags against the blue house, with the country road and layers of fields, was my first choice. This was painted from the boat dock during a recent trip out to Bannerman Island. 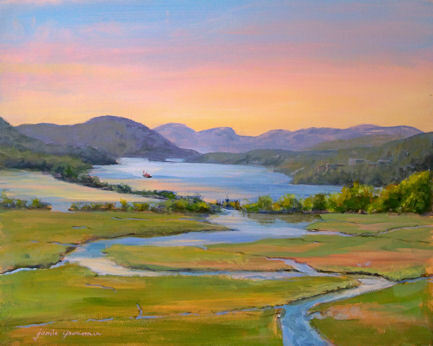 Opportunities to go out to the island are so rare, and I truly cherish the painting time out there! The castle structures are exquisite. A winter storm brought down two large walls on the other side of this castle. 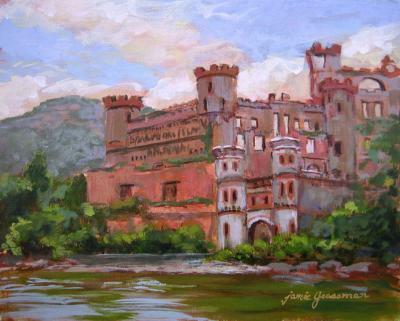 50% of the proceeds of the sale of this painting go to Bannerman Castle Trust for protection and maintenance of the castles on the island. 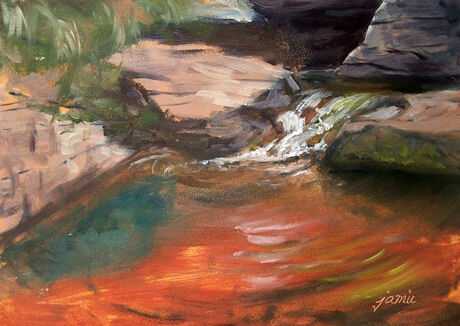 This was painted at the top of Kaaterskill Falls, which is the tallest waterfall in New York State. The stream comes down from South Lake and disappears here over the edge of the cliff. Part 1 of my new studio is finally finished (the painting room). I’m so excited about getting in there with paints and brushes and turning out some pieces worthy of the space. I’m sure I’ll be moving things around a lot as I settle in, but here are a few pics to show it in its finished state and the way it is currently set up. You can click to enlarge any of these images. Above is the view when you first walk in. I set up my painting area in the center of the room. There is so much natural light that I really don’t need to use the ceiling lighting during the day, but I put it on for the photo. There are 12, two-bulb flourescent fixtures. I played a lot with different types/temperatures of bulbs and settled on a combination of 5000K and 4100K bulbs. These are the newer, thin bulbs. I was told that they come on faster and are more efficient. 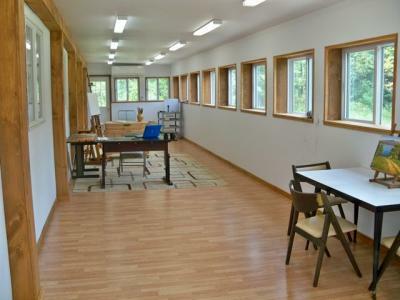 These fixtures don’t emit that annoying buzz at all, and as you can see, they pretty much disappear in the room and don’t call attention to themselves. 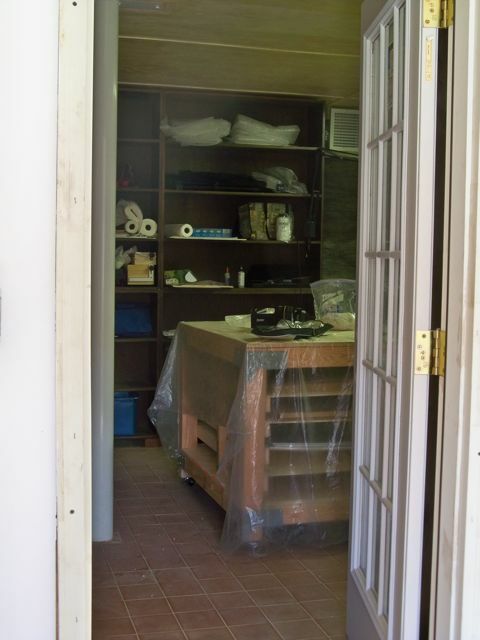 Here’s the entrance, looking back the other way toward the door. Of course, my mascot Rondo has to be a part of the activity. He has loved this bench since he was a puppy. 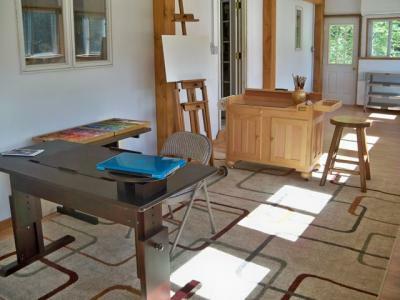 The table on the left is an extra work table or a place to have a snack with friends, or a wine and cheese buffet at an open studio! I have room in this area for a model stand, should I ever decide I want one. 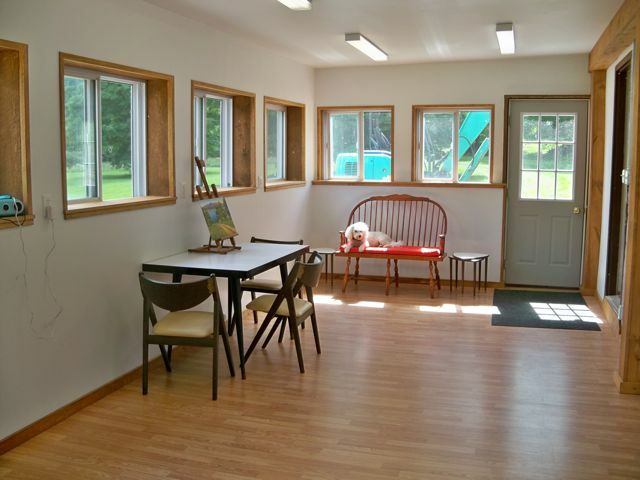 Here’s a photo of the painting area. I took advantage of a fabulous studio furniture sale at Jerrys. It was very timely. But now I am having trouble with the thought of getting paint all over this brand new stuff! The wall to the back on the left side will have drying rails installed for works in progress and newly finished paintings. I think I should be able to get about 32 linear feet of rails on there for sizes 5×7 up to 18×24. 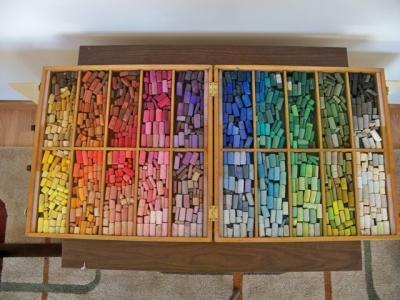 Notice that I FINALLY have a space for my pastels! I can’t wait to dive into this box of jewels again! There will be more photos of that space to come in Part 2 when they finish with it. That’s where I’ll be priming panels, varnishing, framing, and storing most of my materials. The slop sink is going in that area because that’s where the messiest stuff will be done. 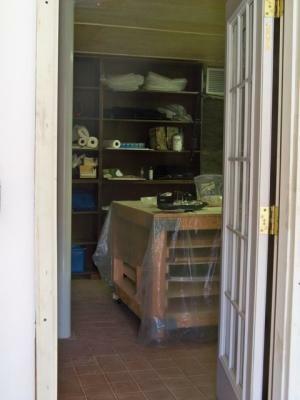 Having this additional space will hopefully enable me to keep my painting room clutter-free. 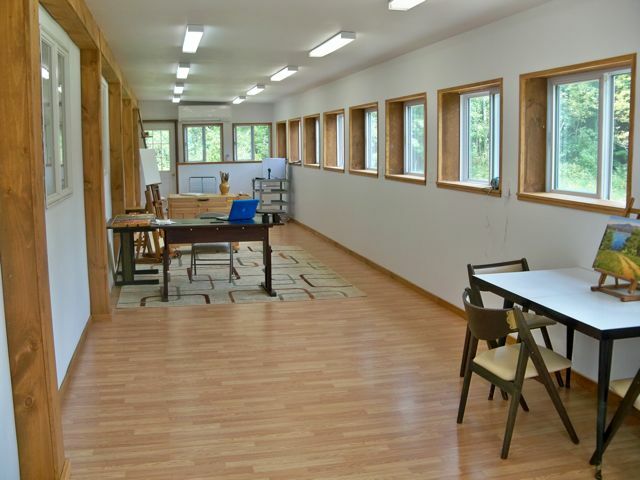 Of course, it will probably never be as clutter-free and clean as it is right now. Once I get in there with paint, all bets are off!